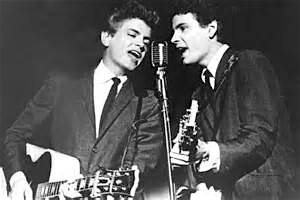 Phil Everly (left), and brother Don, of the Everly Brothers. Phil Everly, of the Everly Brothers, died Friday in Burbank, Calif. He was 74. Phil, and his brother Don, provided the most lush and compelling harmonies in early rock-n-roll. There is a reason the Beatles, Beach Boys and Byrds all credited them with being huge influences. Their parents were folk and country musicians from Kentucky, and the Everly Brothers were well acquainted with those genres, but they put a distinctive spin of their own on their music that earned them a recording contract in Nashville in the 1950s. The brothers charted nearly three dozen hits on the “Billboard Hot 100” between the late 1950s and early 1960s; Bye Bye Love, Wake Up Little Susie, and When Will I Be Loved, to name a few. Artists like Bob Dylan, Crosby Stills Nash & Young, and Simon and Garfunkel, are all indebted to what the Everly Brothers did in merging traditional harmonies with early rock-n-roll edginess. My favorite tune of theirs is Cathy’s Clown, with its snide darkness that taints the surface sheen. These guys came at rock-n-roll from a different direction, and were their own originals. If you think about a table with the originators of rock-n-roll, most certainly it would include the likes of Chuck Berry, Fats Domino, Elvis, Buddy Holly, Jerry Lee Lewis, Little Richard, and Muddy Waters, but the Everly Brothers would be given serious consideration for an invitation. They were one of the first 10 acts elected to the Rock-N-Roll Hall of Fame in the inaugural class of 1986. This entry was posted in Music, News and tagged Don Everly, Everly Brothers, Phil Everly. Bookmark the permalink.